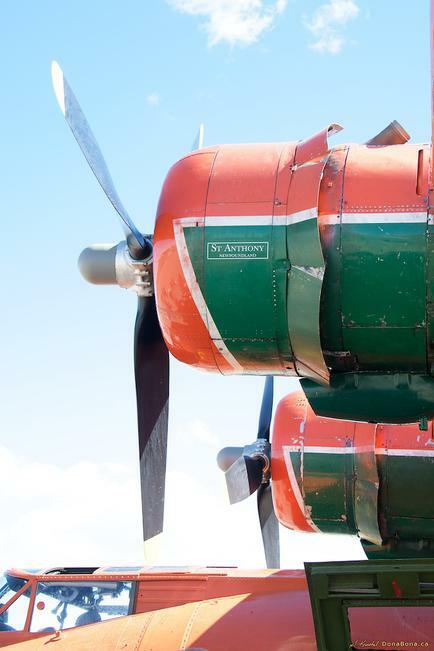 All donations are very much appreciated and will greatly assist with the reclamation of this historic aircraft. 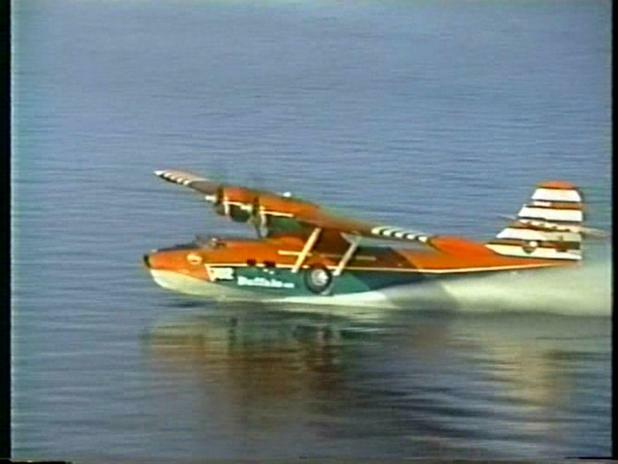 FARS was formed to be the operating wing of the Canso PBY-5A, C-FNJE. 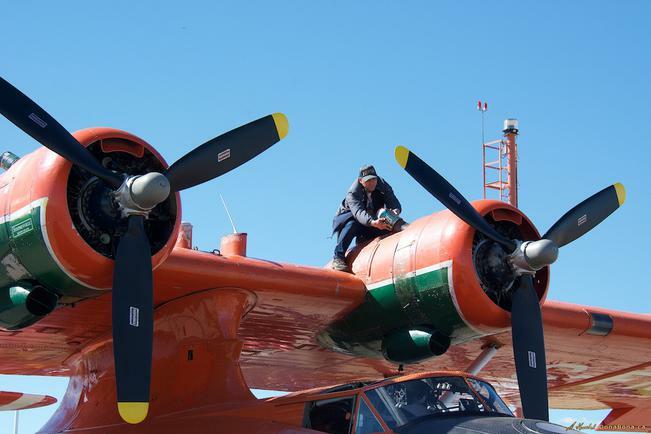 The Society is currently coordinating the restoration of the Canso, raising funds to help rebuild the aircraft and planning to provide hangar space for FNJE and other historic aircraft. 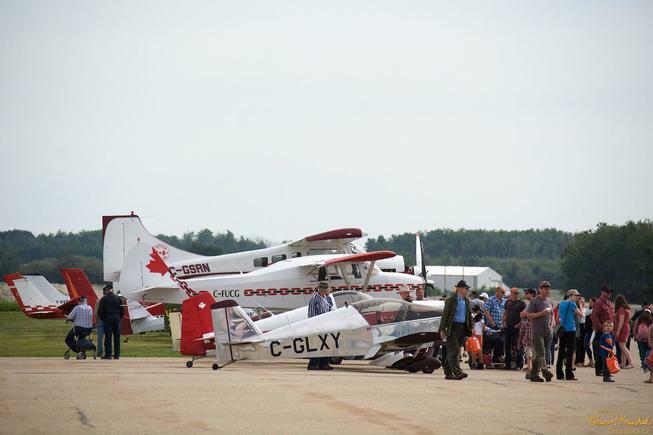 Upon completion of this restoration, FARS will organize demonstrations at airshows and community events to provide school children, aviation enthusiasts and the general public the opportunity to share in a part of Canada's rich history. 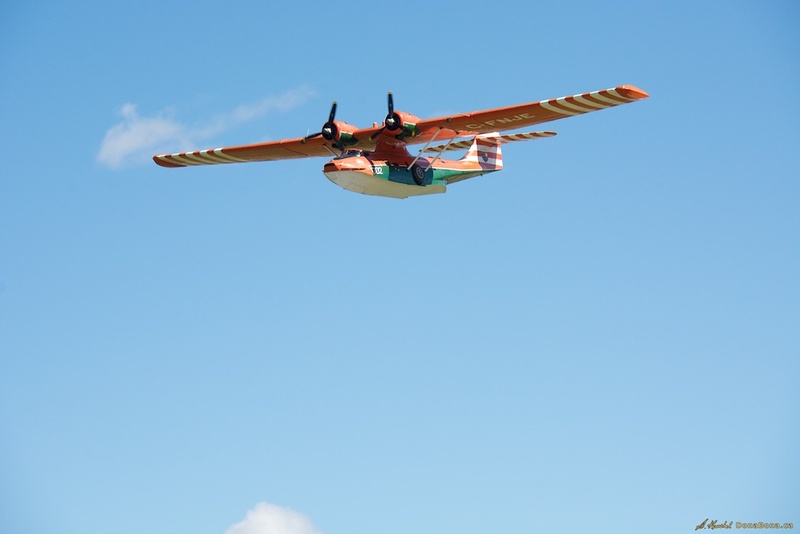 Exciting news this week - the airframe of Canso PBY-5A, FNJE has been rolled out of the shop and reunited with the 104 foot wing - after almost eight years! 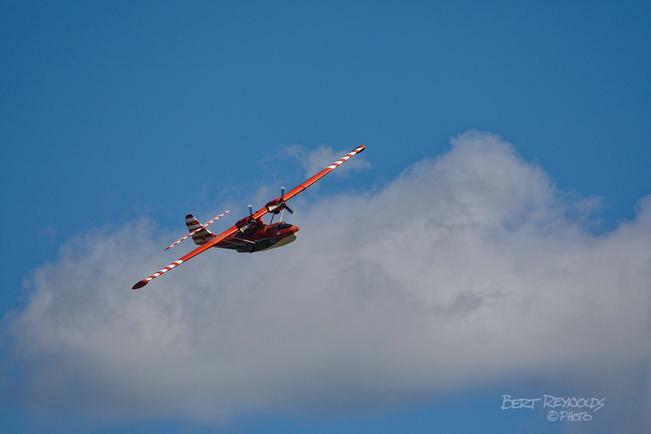 A great day for Canso PBY-5A, FNJE! Also a great day for Canadian History! And a really great day for everyone involved!! 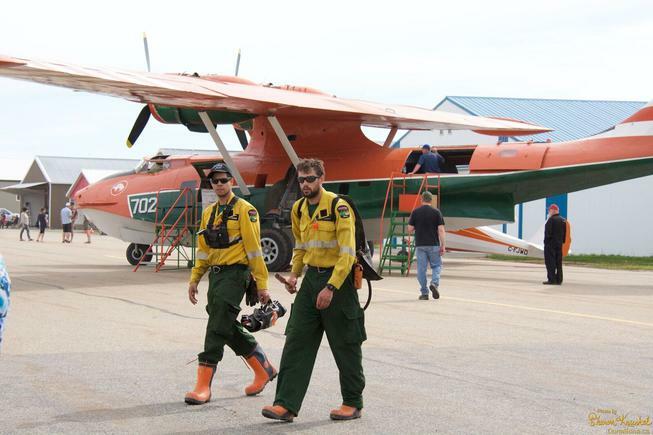 Rodney Kozar, FARS member and former co-pilot of C-FNJE, was in town on days off from his job fighting wild fires at Fort McMurray and stopped for a visit with some of the Canso Crew. 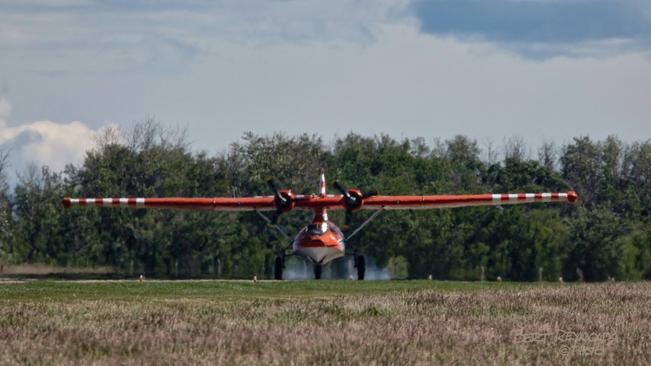 Rodney currently flies one of the CL-215 water bomber tankers for the Alberta Government, following in his father's footsteps as a Canso pilot and a water bomber fire fighter. 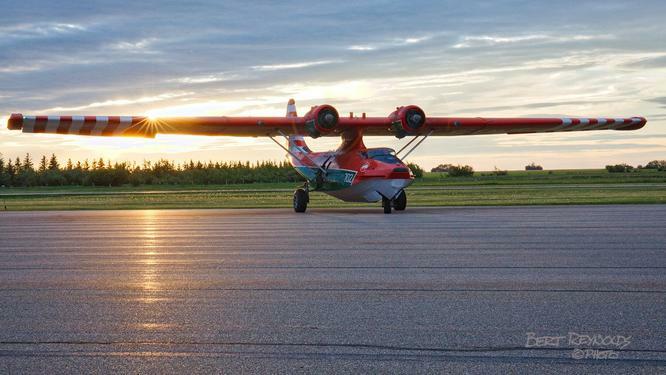 There's been lots of excitement the last few weeks – the wing went on, the rudder was put back in place, both engines were mounted and finally Canso PBY 5-A, C-FNJE almost made it to the Fairview Airport, Tuesday night, June 7th, 2016. 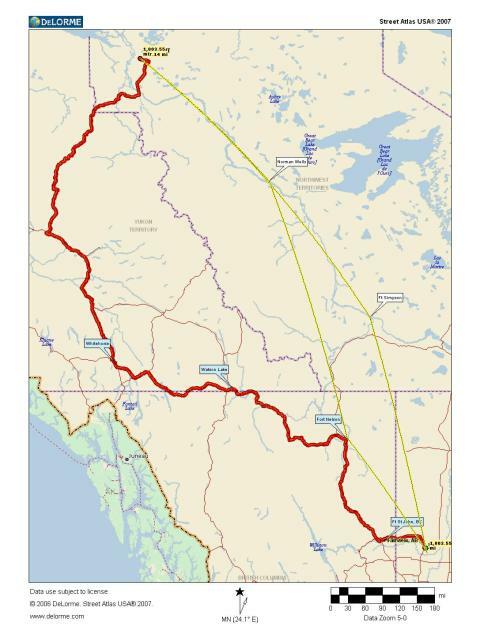 The work-bee lasted until 2:00 AM when the Crew dragged the Canso through a canola field, then loaded it onto an old modified seed drill mover and pulled it sideways down the municipal road for 1½ miles until they encountered a low-hanging power line and a too-tall tail on the Canso! A couple of hours and a lot of ingenuity later, under the power line it went and continued up the road. Another mile further the Canso was unloaded from the drill transport and back on its own wheels to head across another grain field. You can just imagine the look on the faces of passersby, that next morning, when they saw that big old plane sitting there along the highway, in a field, a half a mile from the airport! 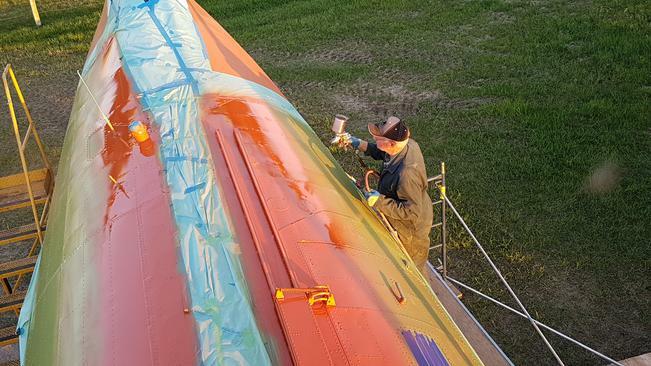 In the light of day the journey continued, down the highway for a half a mile, stopping traffic for 20 minutes, and onto the country road where the Canso Crew had to clear some trees to make the 100 foot right-of-way just a little bigger to accommodate the 104 foot wing span. It's amazing how many trees there are in just 4 extra feet! Then back through another field and onto the runway at the airport, just when the rain started. What a break that it held off that long! 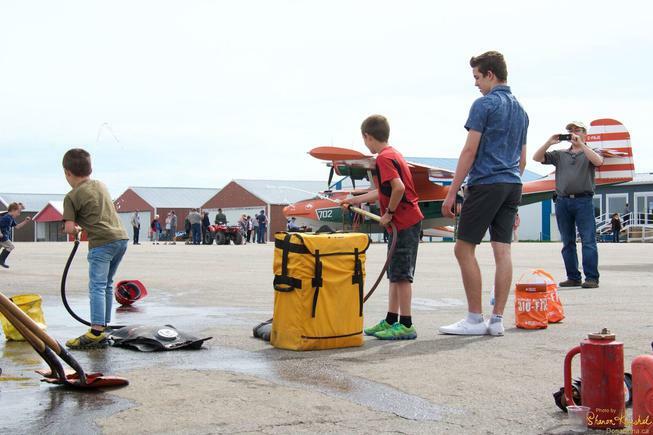 Fairview Aircraft Restoration Society (FARS) had a great opportunity to share the fruits of all the efforts that have gone into the restoration of the Canso PBY with the aviation community and local people at the Father's Day Fly-In Breakfast on Sunday, June 19, 2016. It was a very successful and enjoyable morning. 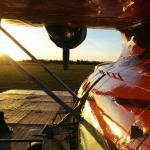 The weather was great, the food was great, we had 26 landings including 2 helicopters. 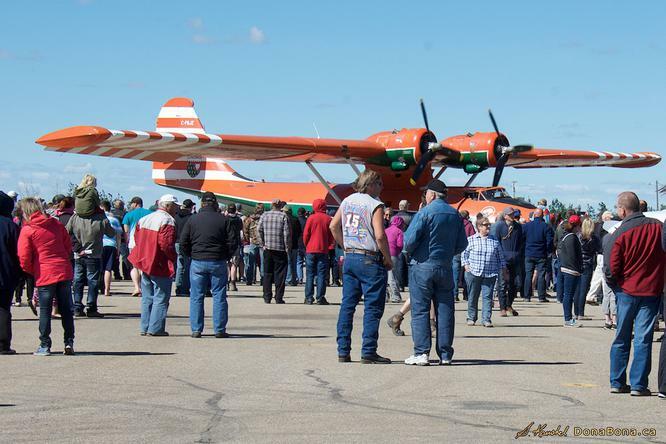 Of course, FARS was delighted to have the Canso there on location and proud to show it off to the more than 400 visitors. The cars were lined up half way back to Fairview. Next year we will maybe need to get a shuttle for a park and ride. 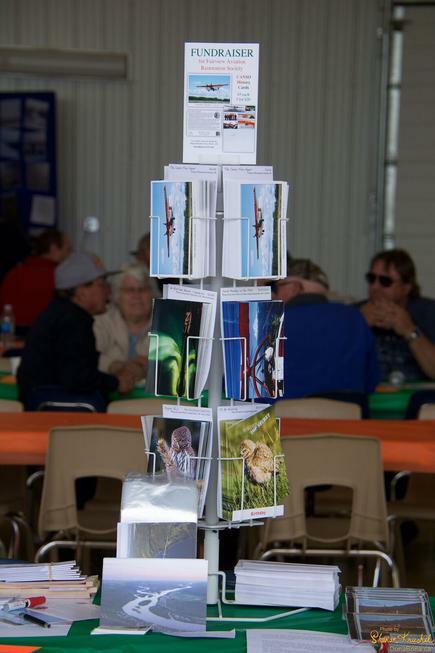 A big attraction to the event was the Grand Opening of new Fairview Air Terminal, a cooperative venture between the M.D. of Fairview # 136, the Town of Fairview and the County of Clearhills. 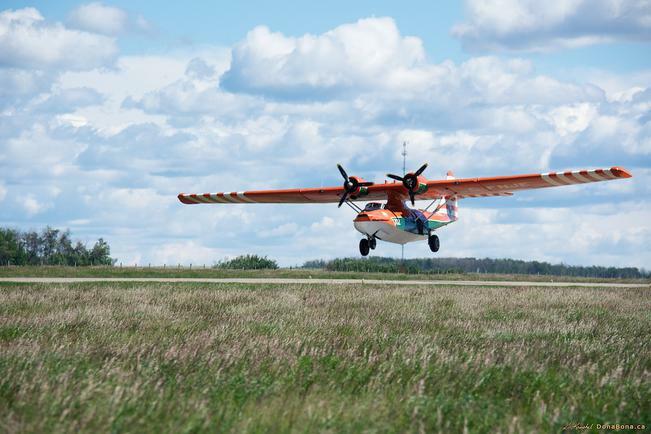 Other highlights of the morning were visits from Stars Air Ambulance helicopter, Alberta Sustainable Resources (SRD) Fire Attack Team, from Peace River, in another helicopter and the visit from a CL-215T Alberta water bomber, fresh from the wildfires at Fort McMurray. It was very impressive to see that big modern water tanker there on the tarmac in front of its predecessor, the Canso PBY-5A. 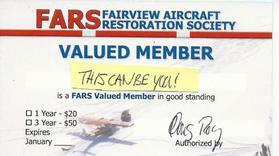 Membership Drive: We would be very pleased to have you renew or join the Fairview Aircraft Restoration Society! Our membership has been the driving force behind FARS, to date, and the membership will take the project into the future. 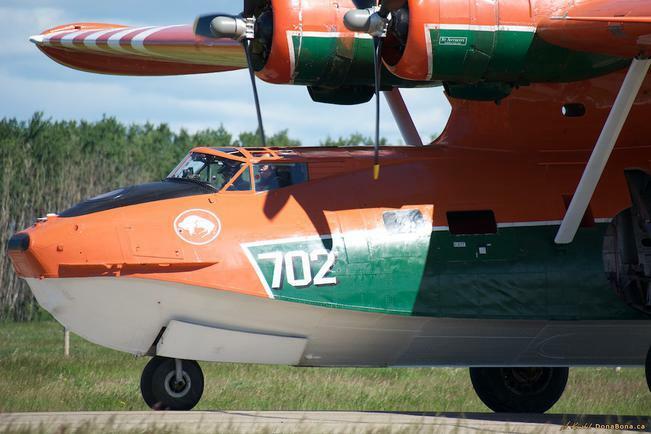 It will be the FARS members that take the Canso to the people and keep the proud history of this aircraft alive. Memberships are available from any of the FARS directors or by mailing FARS, Box 78, Fairview, AB T0H 1L0. We'll be happy to send your membership card to you. 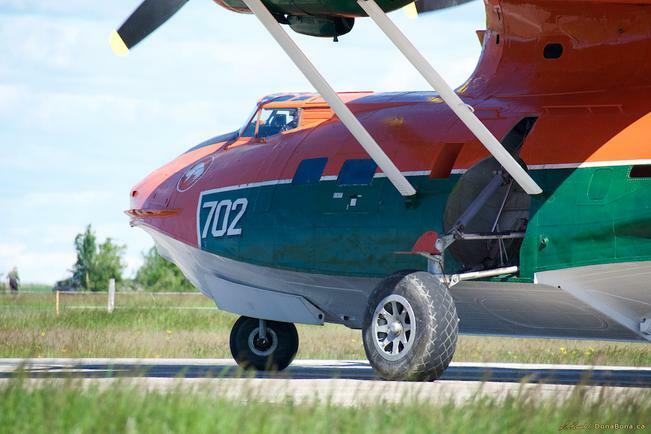 Canso PBY-5A, C-FNJE, as tanker 702, loading water for forest fire fighting in the Northwest Territories. 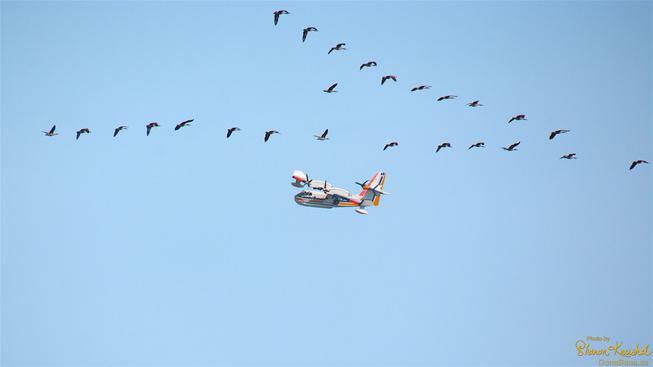 Photos provided by Rodney Kozar, FARS member and former co-pilot on FNJE in 1997, with Buffalo Air. 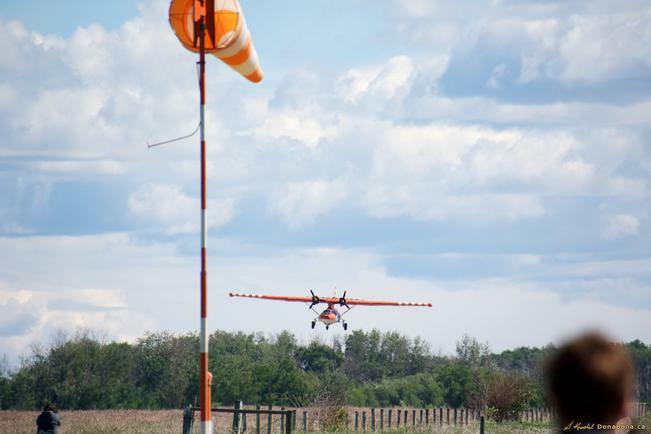 Rodney is currently a pilot of the Alberta Government's CL-215T's stationed at Slave Lake, AB and responding to wildfires across the country. 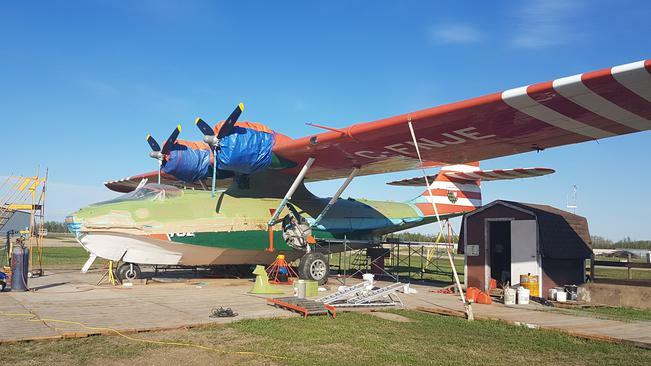 It's been a busy and productive summer for the Fairview Aircraft Restoration Society (FARS) with restoration of Canso PBY-5A, C-FNJE. 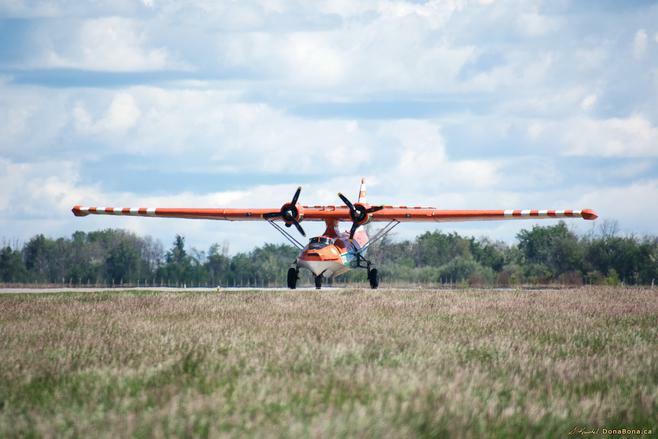 Firstly, the 104 foot wing was lifted back on the airframe, the engines were re-installed and then the aircraft was moved overland for about 5 miles to it's new home at the Fairview Airport. Since that time the electrical, hydraulic and all other systems have been connected and checked and now it's almost time to run the engines! FARS is most grateful for the generosity of Brian and Karen Wilson for the use of two of their shops, their yard, their tools and equipment during the eight early years of the restoration of the Canso. Without their assistance the restoration would not have progressed as it did - FARS will remain very, very appreciative. 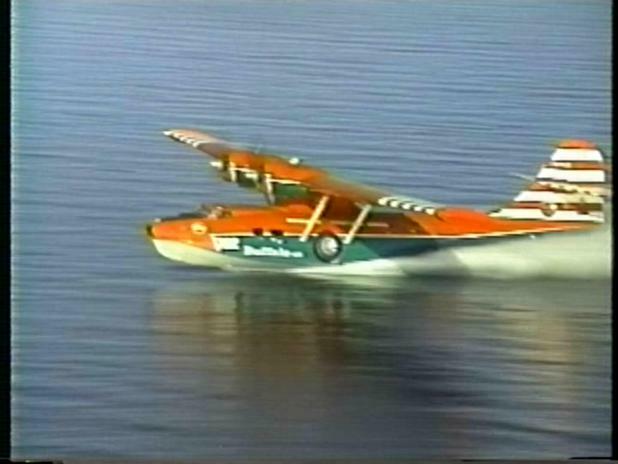 For the very first time, on November 13, 2016 both Pratt & Whitney R-1830 Twin Wasp Radial Engines, rated at 1200 hp each, roared to life on the Canso PBY-5A, C-FNJE! "GREAT CANADIAN AIRCRAFT ENGINE EXCHANGE"
without your act of generosity the whole engine exchange would not have happened. 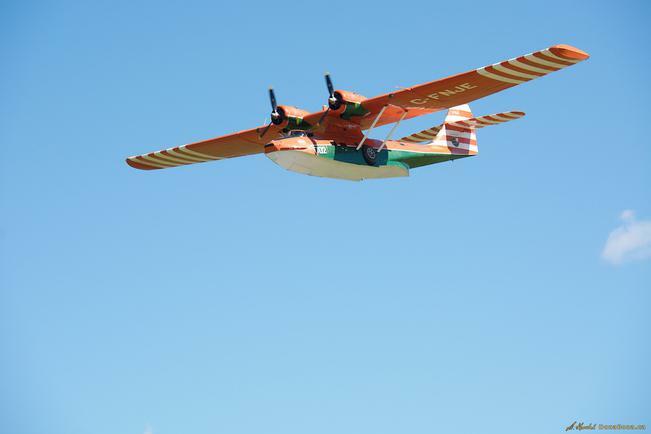 "A review of the Fairview Aircraft Restoration Society Maintenance Schedule Approval for the Consolidated Vultee PBY-5A is now complete and found acceptable. 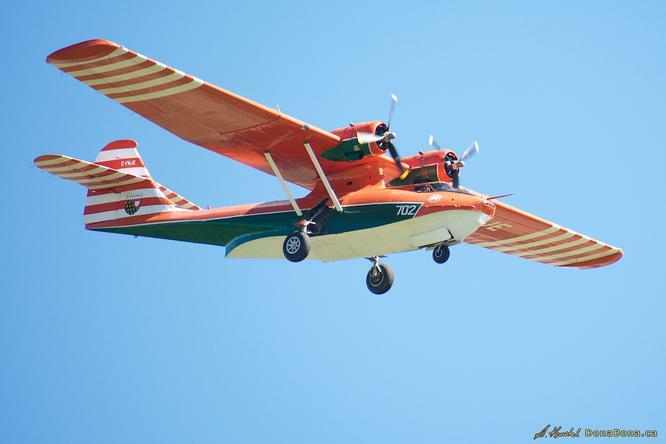 Please find attached MSA RAXE-FNJE-PBY-5A. 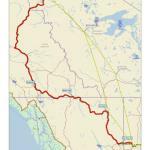 The Original document and letter will be mailed from this office in the near future." 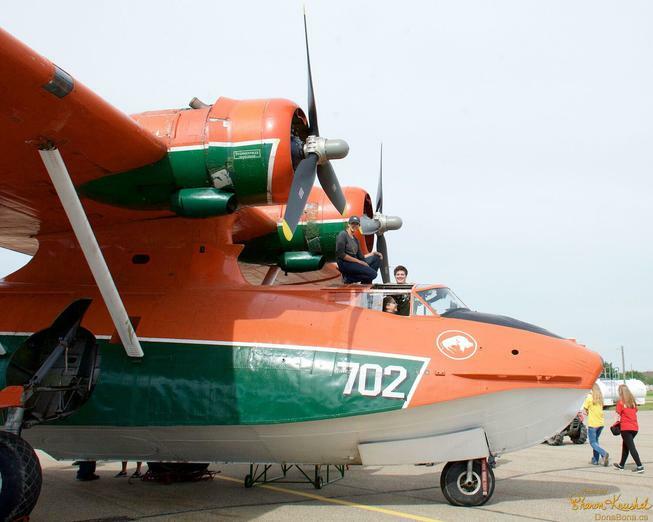 This is incredibly good news and the Canso is now just one more step closer to being ready to fly!!! 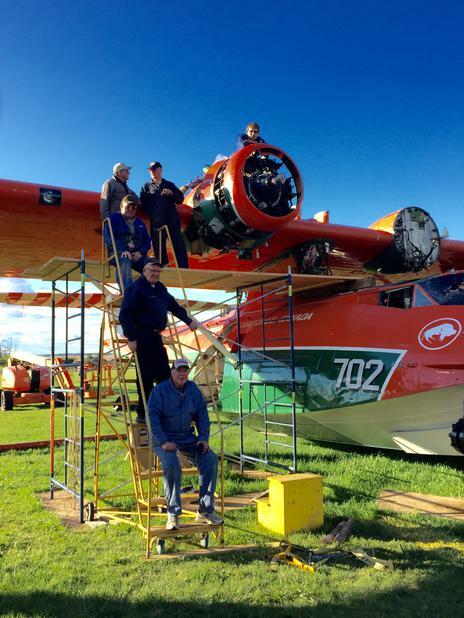 DECEMBER 2016 - Fairview Aircraft Restoration Society (FARS) had to finally put the Canso away for the winter. Shown below was the move to its designated parking area alongside the Save the Canso Clubhouse. 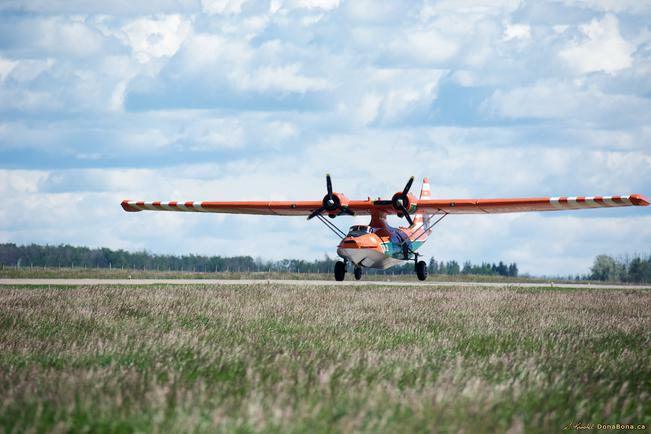 Work-bees continue on a smaller scale but plans are now in full swing for spring and the first "official" flight of Canso PBY 5-A, C-FNJE on Father's Day, June 18, 2017. Stay tuned for more information. 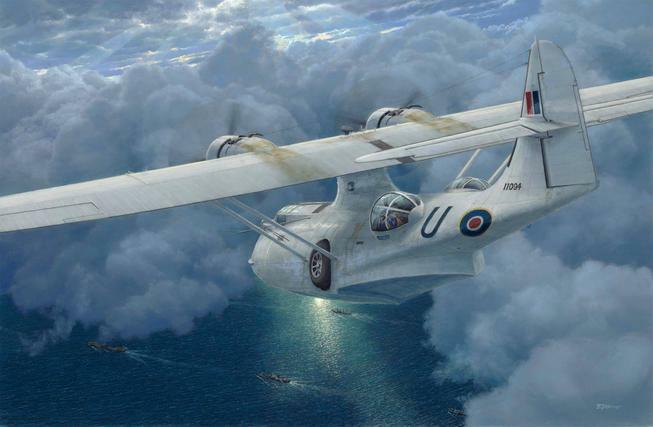 ​Flight Lieutenant Jim McRae was onboard the Canso PBY-5A Patrol Bomber 9816 when, after a successful strike on an enemy submarine, was hit by gun fire from the sub and went down in the North Atlantic. 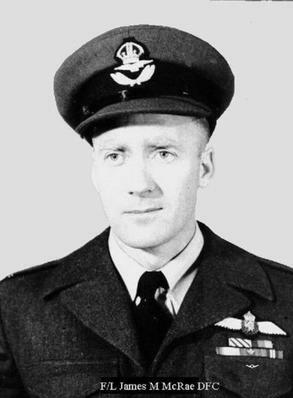 Click the link below to read his story or to listen to Mr. McRae tell, in his own words, the details of that fateful day in history and the loss of RCAF Canso 9816 and three of it's crew members. 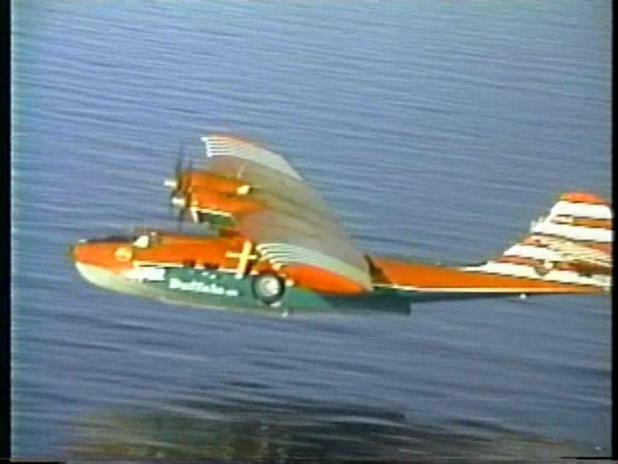 Canso PBY-5A, FNJE, formerly known as RCAF 11094. To lead you to the history, goals and aspirations of our non-profit organization, please check out the buttons to the left. 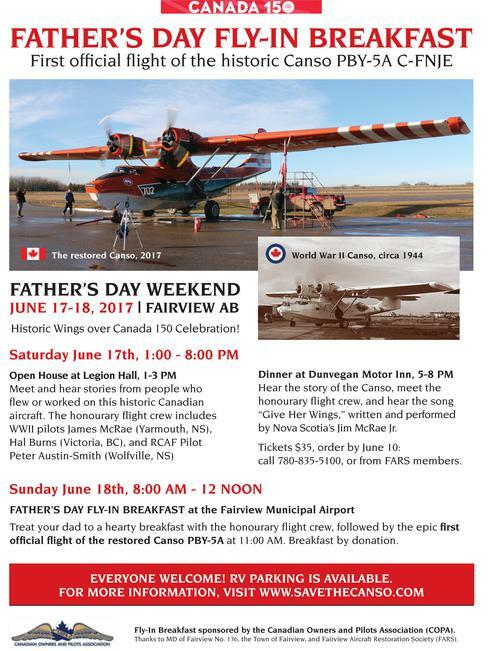 The date for the long awaited "First Flight" since restoration is June 18th, 2017 at the Father's Day Fly-In Breakfast and Historic Wings Over Canada 150 Celebration! The Honourary Flight Crew is now up to SIX! WWII pilots Jim McRae (Yarmouth, NS), Hal Burns (Victoria, BC), Bruce Olson (Edmonton) and RCAF pilot Peter Austin-Smith (Wolfville, NS), Flight Engineers, Herb Chanin (Winnipeg, MB) and Robert Smith (Elnora, AB). 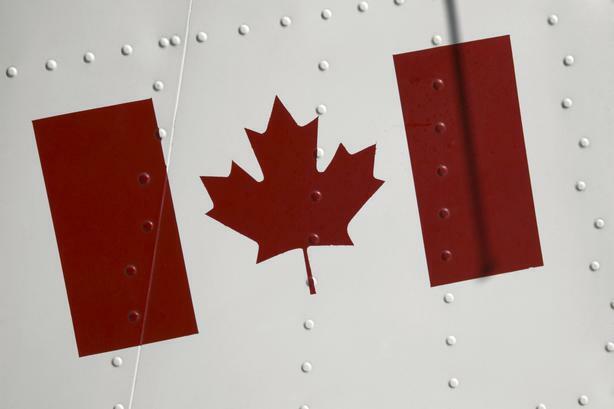 Flight Engineer Roy Foster of Wetaskiwin, AB regrets he is unable to attend. Plan to come join in the fun! The Canso gets on solid footing - a new "boardwalk" - thanks to long-time FARS' member Brian Wilson and son Jason who donated the wooden mats. 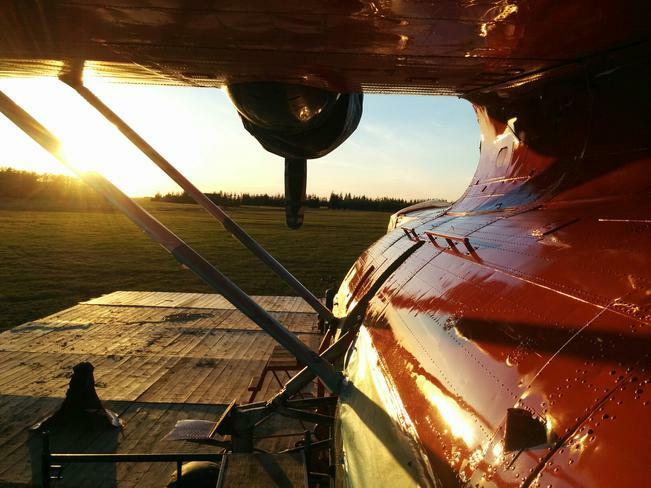 Hurrying to lay oilfield mats before the spring thaw to create a safe and secure place to finish restoration work on the aircraft. 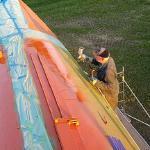 It was non-stop for two days and with the help of dozens of volunteers everything was great! The help and support of FARS members and the community at large was amazing and the only way a event of this size can be possible. Thank You All! Special thanks for Captain W.J. 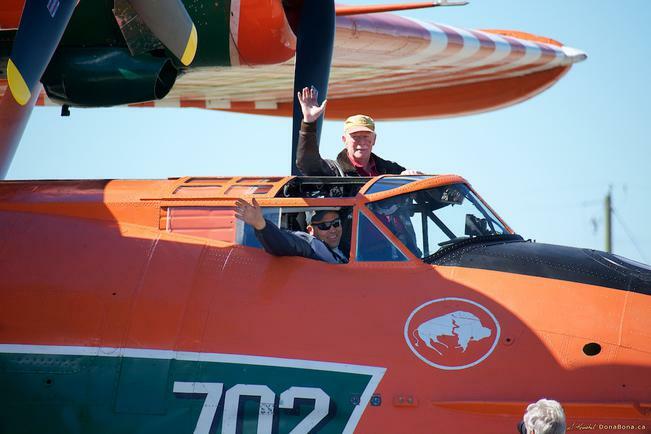 (Bill) Brady and his Co-Pilot Gary Wieben for taking the Canso PBY-5A into the air for the official "First Flight"
June 17 & 18th, 2017 - WHAT A WEEKEND! First, at the Open House at the Fairview Legion, where our Honourary Flight Crew of six RCAF Veterans received a warm, appreciative and patriotic greeting from an enthusiastic full house. Then, at the Celebration Dinner in the evening, to a sold-out room, the Flight Crew and the Canso Crew were joined by so many other supporters to raise a glass to the First Flight of the Canso and hear it's colourful history. 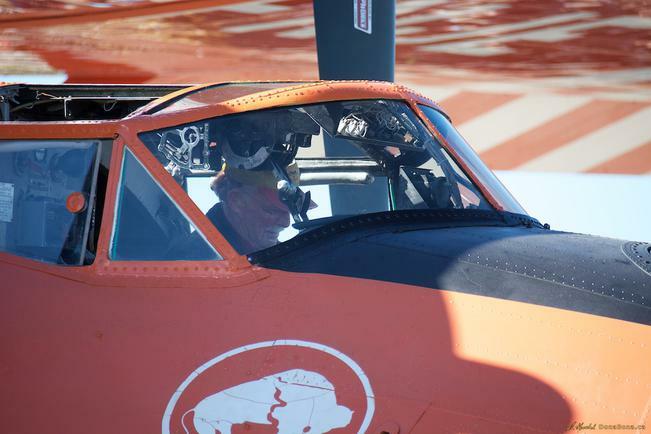 All ears listened closely as the Honourary Flight Crew shared their stories of how they had connected with the Canso, as young men more than 70 years ago. 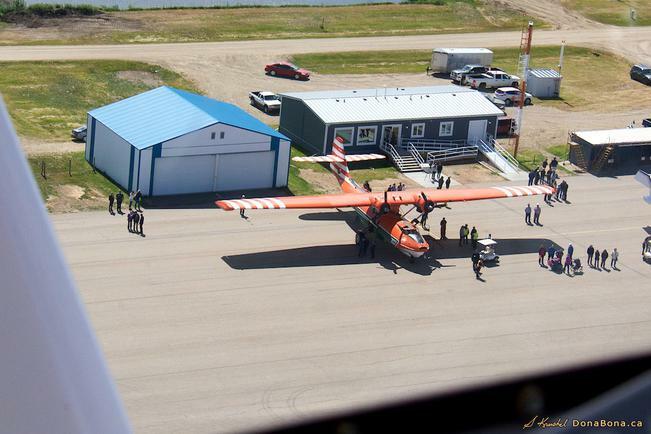 The Canso taxied out and started it's warm-up. There was some sputtering, some backfiring, some smoke - and the crowd of well over a 1000 thought "oh no". 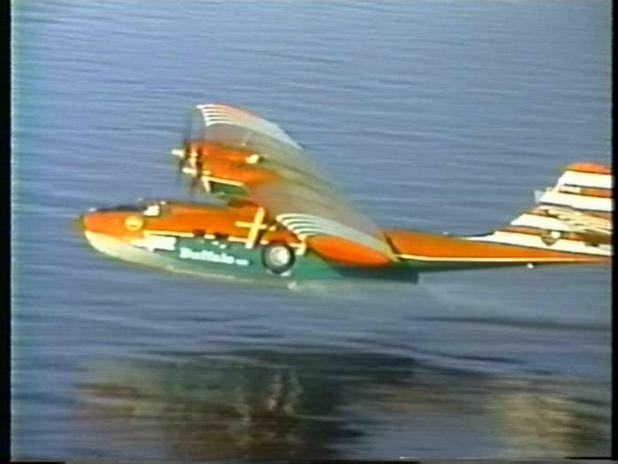 And then ... Captain Bill Brady and Co-Pilot Gary Wieben headed the Canso down the runway, turned into the wind, gave her full throttle back toward the crowd, and she lifted like a bird into the clear blue sky!! 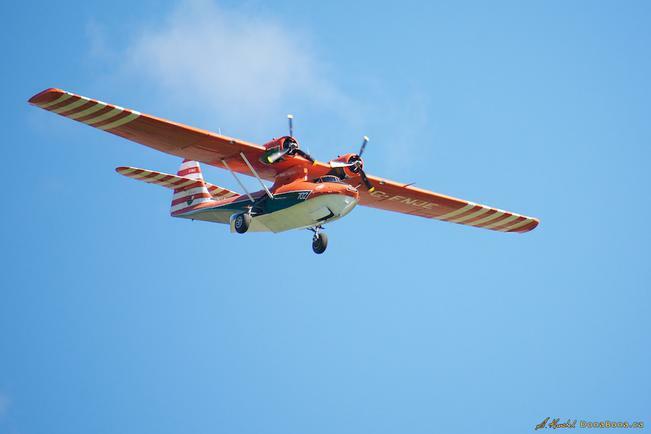 What a thrill for all as the crowd clapped and roared when the Canso PBY-5A made a perfect take-off on its "First Flight". 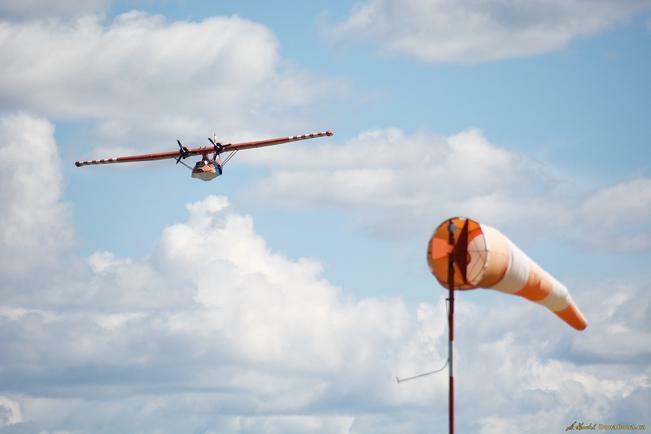 It is with great sadness Fairview Aircraft Restoration Society (FARS) announces the passing of a very good friend, mentor, and inspiration to us all. Roland (Rollie) Hammerstedt of Kenora, Ontario, passed away at the Lake of the Woods District Hospital on Friday, July 21, 2017. 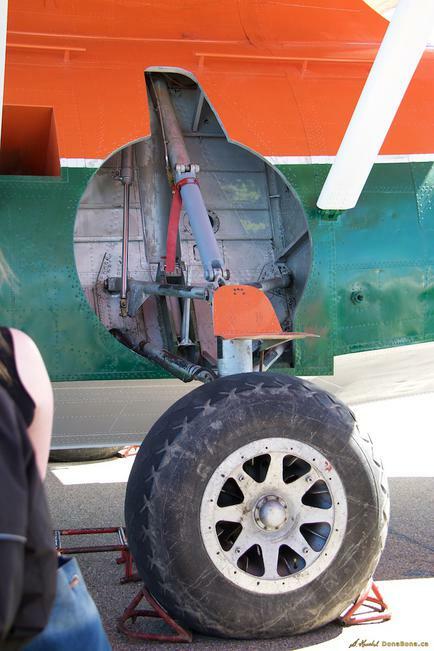 Rollie spent over six decades as an Aircraft Maintenance Engineer (AME) on all sorts of aircraft but seemed to have a special connection with the old radial engine powered Canso PBYs. He knew everything about them and was always willing to share his knowledge. Rollie travelled to Fairview at least twice a year for the past seven years to spend two to three weeks working with our AME, volunteers and summer jobs AME students. There was always great progress made when Rollie was here and we all benefitted from his wealth of experience. FARS extends its deepest condolences to his wife Shirley and family. 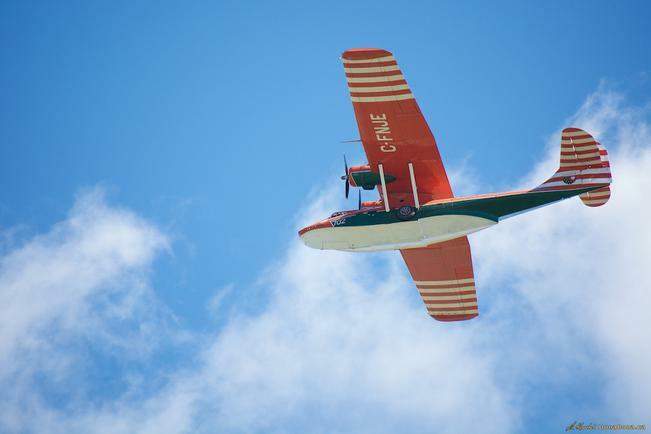 We will miss Rollie greatly and will think of him often as the Canso takes to the skies, remembering his amazing contribution to the project. 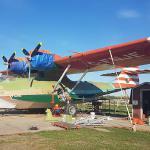 Fairview Aircraft Restoration Society (FARS) and the Canso PBY-5A, C-FNJE is on the move again this week! 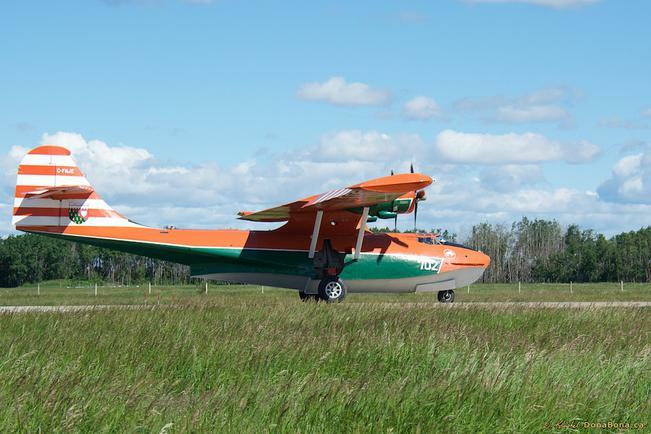 First, we are off to visit our friends at the Peace River Airport for their FLY-IN BBQ, August 17, 2017. 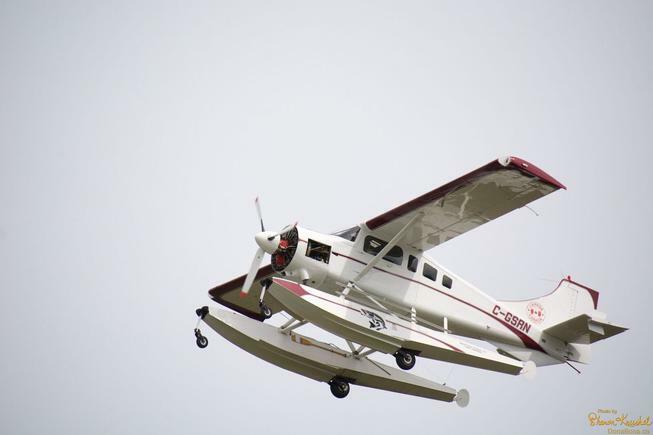 Come out and watch the Canso fly-by and enjoy a great BBQ with fellow aircraft enthusiasts. 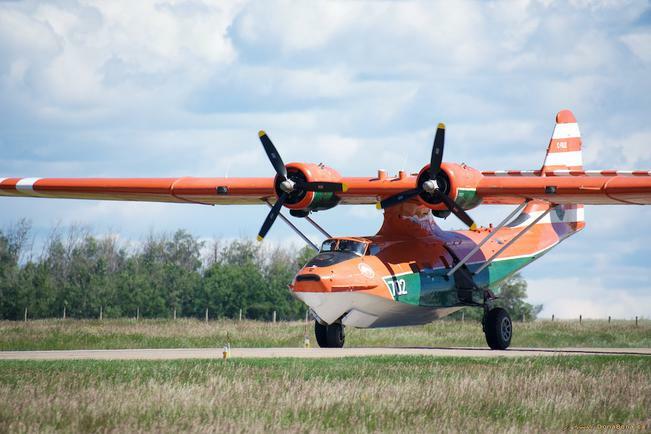 ​Then later this week FARS and the Canso PBY will be flying to Villeneuve, AB to take part in the Edmonton Air Show. If you are in the area come on out to see us on display! The Edmonton Air Show runs August 19 and 20th, 2017. 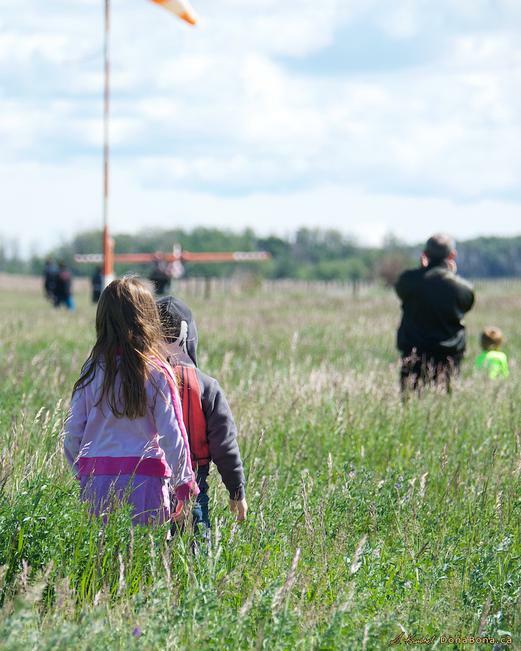 Watch the skies over Fairview and area later this week as the Canso takes off or lands and gives a “tip of the wings” to all our friends below!! 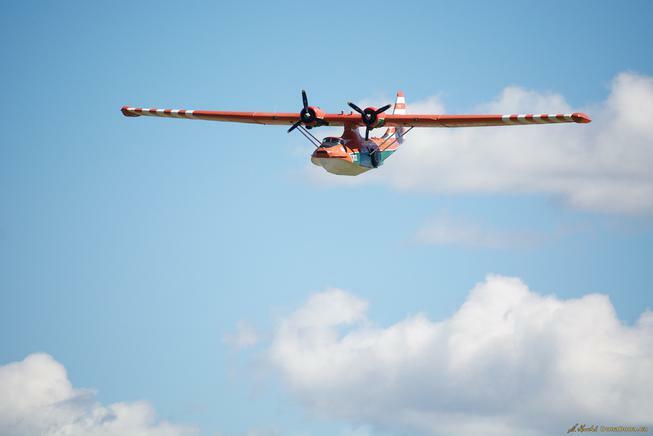 The restoration is done and the Canso PBY is airworthy and flying beautifully but the support of our members and others interested in keeping this historic aircraft in the air to be shared with others will always been needed. 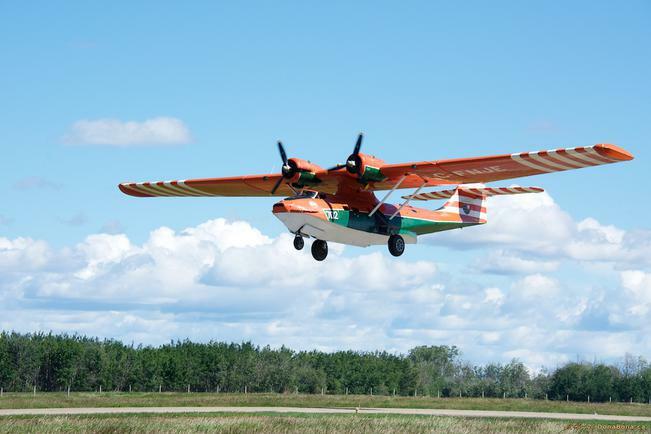 It seems the Canso PBY-5A, C-FNJE was a big hit at the Edmonton Air Show - a great crowd of enthusiasts arrived, in spite of the wind, and enjoyed themselves among the aircraft, new and old. 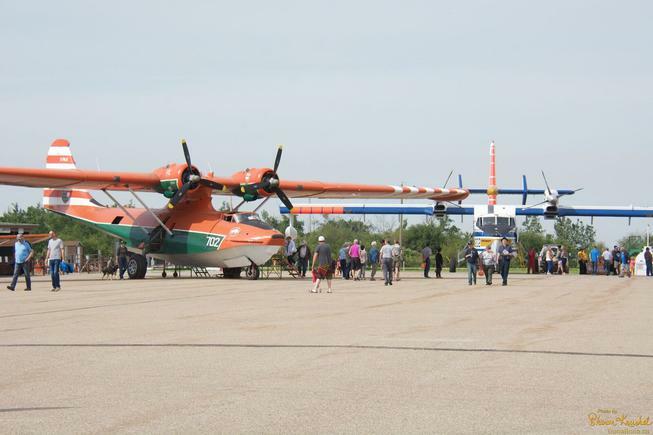 The Canso had line ups all through out both days, except when the Snow Birds flew. The best guess is that between 3 and 4,000 people toured through this historic old bird, and came out smiling! 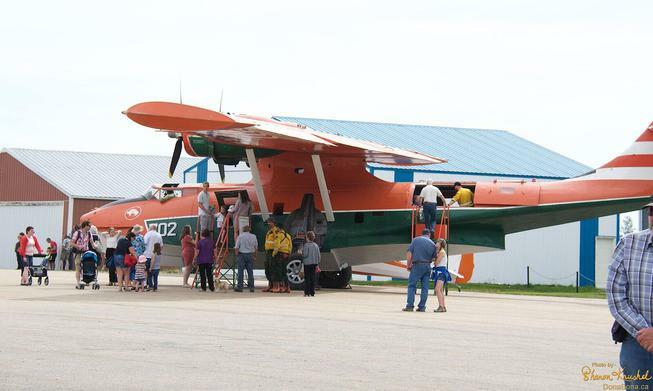 The members of Fairview Aircraft Restoration Society (FARS) and all those who came to watch the "first flight of Canso PBY-5A, C-FNJE will long remember the day we had six WWII Veterans who flew or worked on this very Canso during the War, with us here in Fairview. 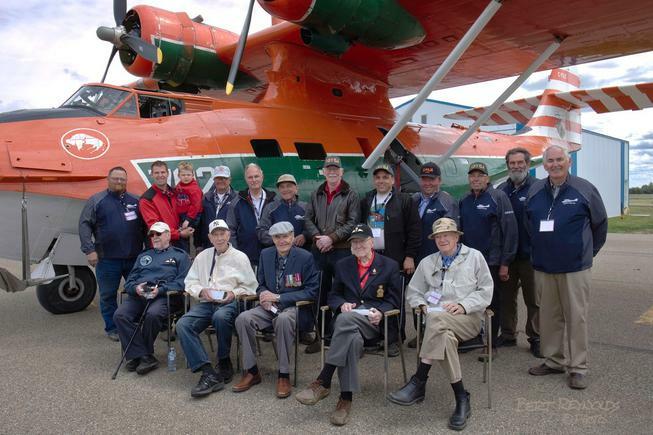 They came to witness the Canso take to the skies one more time and we thank these gentlemen for being here and we most sincerely thank them for their service. Listen to Jim McRae Jr.'s song " Give Her Wings"
Thanks to all the members who joined FARS or renewed their membership during Membership Month. The newest member, and probably the farthest away, is from Australia and associated with the Rathmines-Catalina.com restoration of a PBY for display purposes at their Memorial Park. Glad to have Malcom Burns onboard. 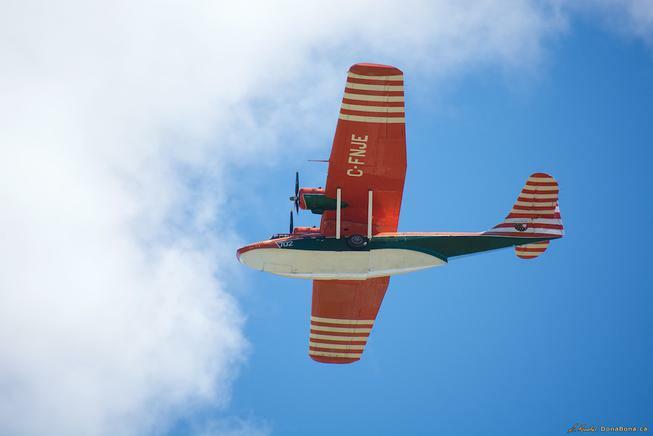 All donations are very much appreciated and will greatly assist with the ongoing display of this historic aircraft as a flying museum, Tax Receipts will be issued for donations. Veteran WWII RCAF pilot Hal Burns, along with FARS member Doug Roy, views artist Brian Hohner's painting depicting Canso PBY, RCAF 11094. 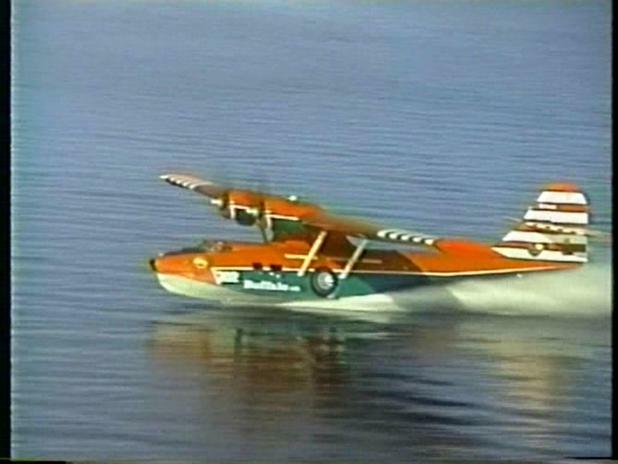 Of special note, Burns flew this actual aircraft during the War. 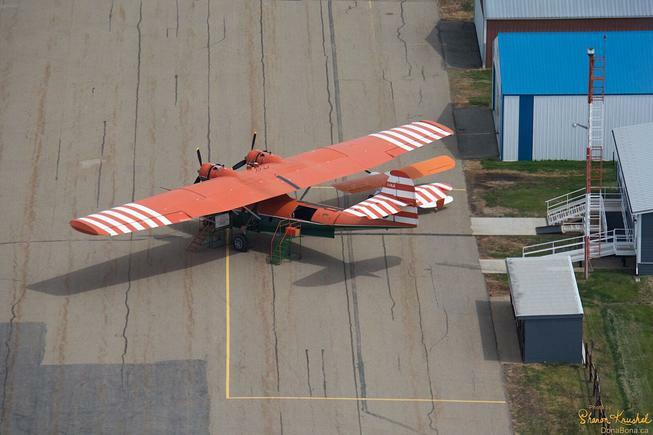 After countless volunteer hours the Canso has now been restored to flying condition by the Fairview Aircraft Restoration Society (FARS). FARS started the 2018 flying year off with the unveiling of a wonderful painting of C-FNJE back in 1944-45​, when she was known RCAF 11094. ​This painting was commissioned by FARS member Henry Vos and painted by local artist Brian Hohner of Manning, AB. 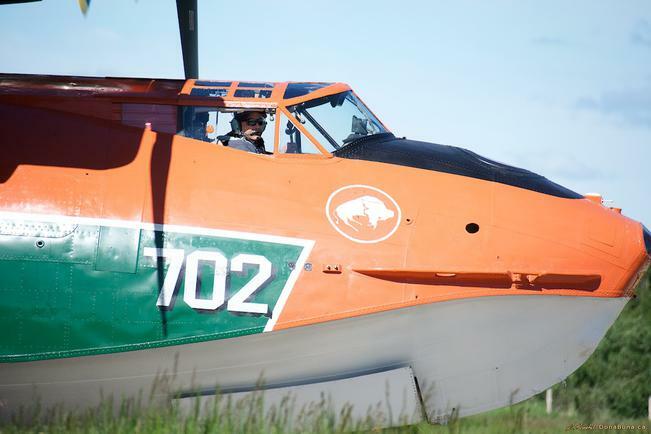 It depicts the WWII years when the RCAF fleet of PBYs flew out over the North Atlantic, protecting the allied troop and supply ships as they travelled back and forth between North America and Europe. Brian very successfully captured that moment in time when 11094 broke through the clouds to get close to the convoy. Limited Editions Prints are available and Henry and Brian have generously offered a portion of the proceeds in support of the Save the Canso Project in its ongoing goal to share this special part of our country’s history. 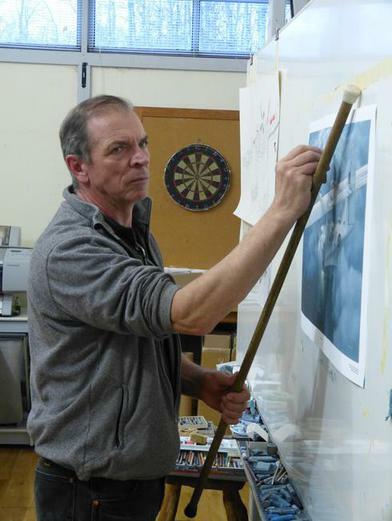 Artist Brian Hohner puts the final touches on his painting of Canso 11094 depicted in the colours used during WWII and fitted with guns, depth charges and a crew of courageous young men. 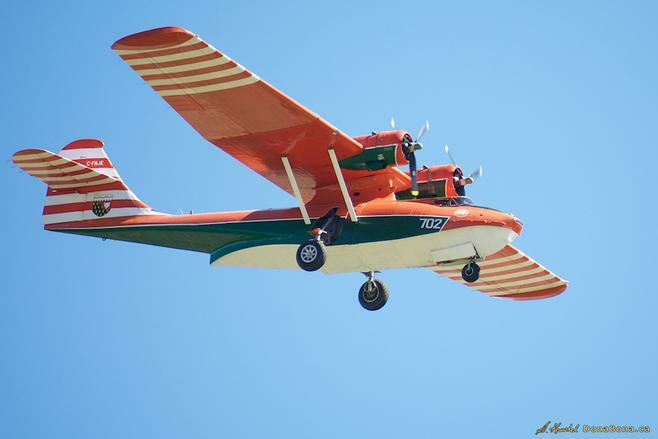 Interested in acquiring a numbered limited edition print of this historic aircraft for Dad for Christmas? Click on the envelope to the right, and we will send you information on how easily that can be arranged! Thanks. 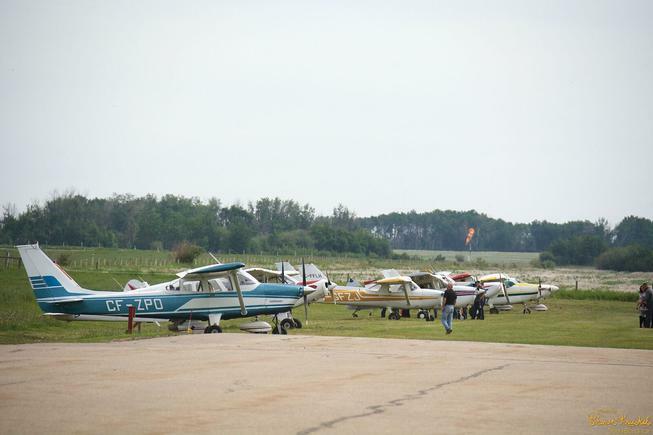 Great day at the Father’s Day Fly-in Breakfast sponsored by COPA, FARS, MD of Fairview & Town of Fairview. 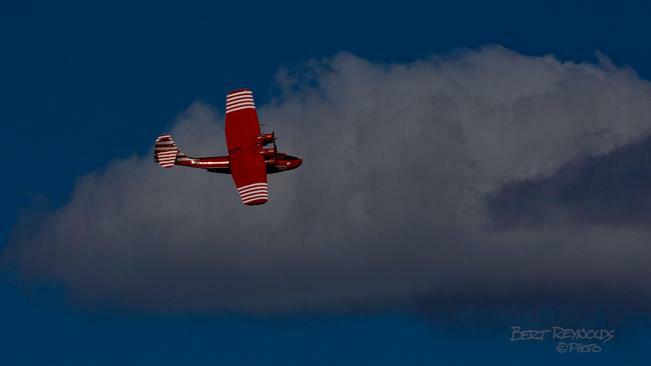 Thanks to all the pilots who shared their planes with us! 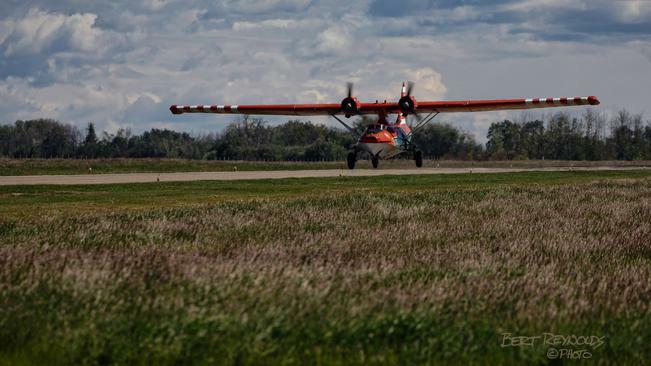 Special thanks to AB Forest Service for showing up with the Helicopter Attack Crew and the amazing CL-215 Water Tanker. Always grateful to our volunteers who make this event so successful. The only disappointment of the day was that the CANSO C-FNJE could not fly as planned. 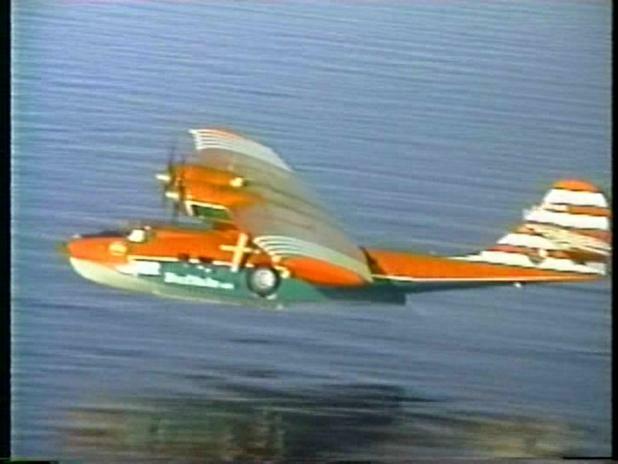 The crew went for a test flight the night before - they had a great flight but when they went to land a faulty brake was discovered, while Captain Bill Brady was able to land safely it was decided that the Canso was grounded temporarily... SAFETY FIRST. 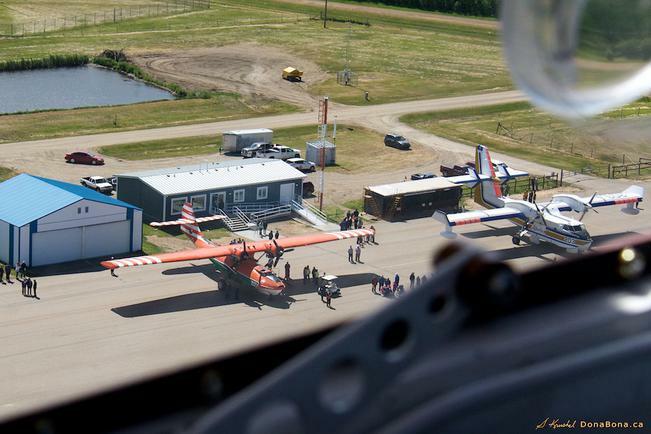 Photo Above: from the Webpage of the Edmonton Airshow, shows the Canso on display for the huge crowds! 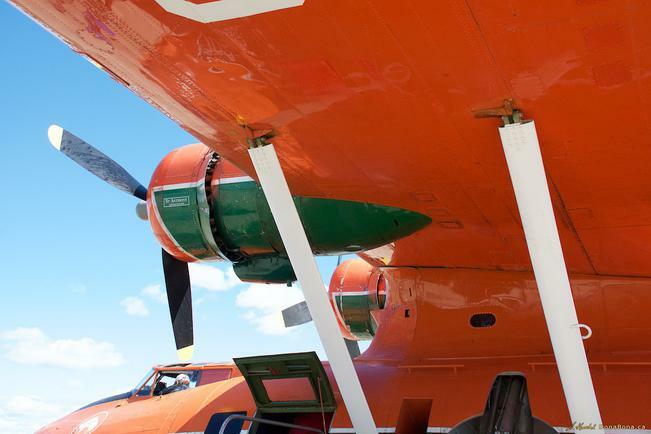 ​The Canso hanging out with the RCAF Snowbirds! 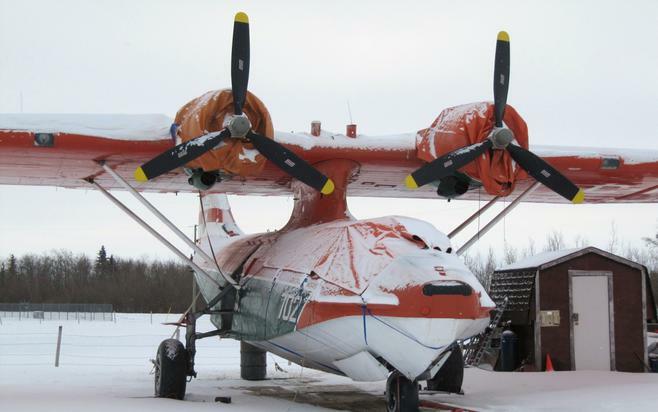 ​FARS Canso C-FNJE sits out the winter waiting for the spring and summer to arrive so she can resume her air show and history tours. Being out in the cold is not new to C-FNJE, as when she was numbered 11094 and belonged to the RCAF she spent the winter of 1944-45 in Reykjavik Iceland hunting Nazi U-boats. 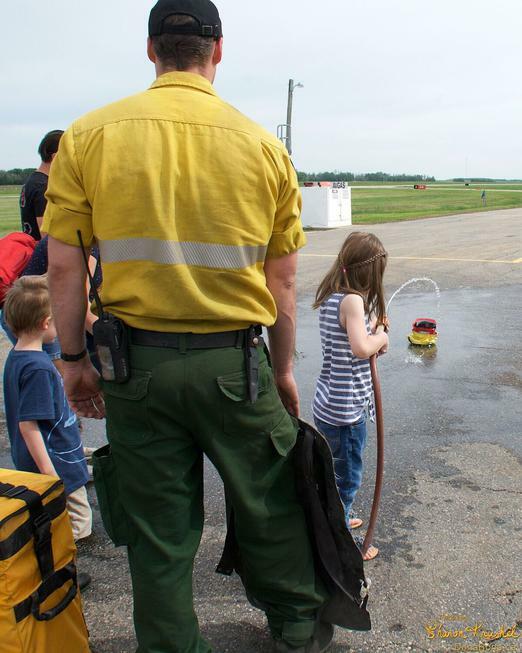 THIS IS FARS MEMBERSHIP MONTH! Only $20/year or $50 for a three year membership. If you are considering becoming a member - thank you in advance. We would be very pleased to have you join us. Are you unsure of your FARS membership status? Just click on the envelope to the right and we will be happy to send you the information from our files! Thanks. 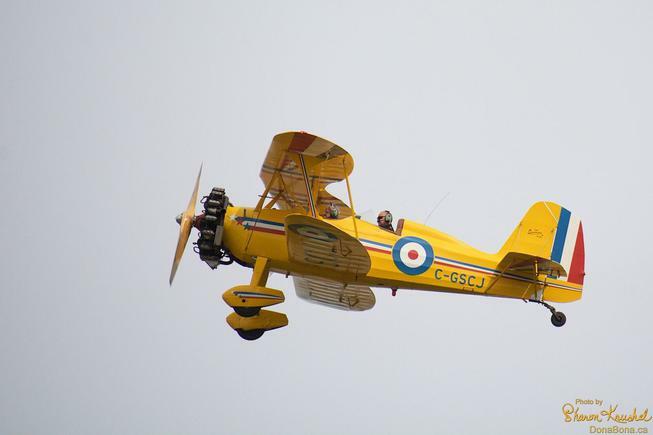 Bonus: the names of two lucky new members or renewal members will be drawn for a CD of "Give Her Wings" written and performed by Jim McRae Jr., son of 101 year old RCAF Veteran, James McRae, of Dartmouth, NS. 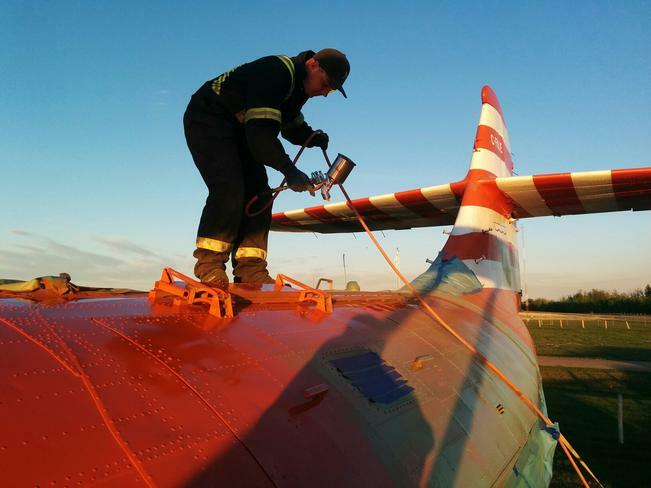 Jim wrote Give Her Wings as a tribute to his father and to help commemorate the June 2017 "First Fight" of the fully restored Canso PBY-5A. James McRae, Sr. flew this very aircraft during WWII as Patrol Bomber, RCAF 11094. The draws will done in April 2019.